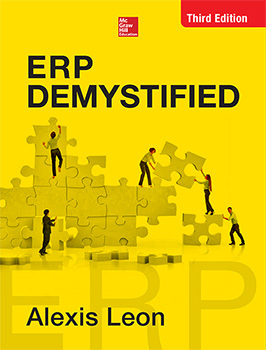 This book demystifies the myths and misconceptions about ERP and provides an overview of the technologies that will work with ERP systems to make organizations work at high efficiencies. This updated, revised, and enlarged Third Edition comprehensively covers the implementation of an ERP system that is best suited for an organization—right from package selection, team selection, implementation plan preparation, implementation, project management and monitoring, training, post implementation tasks, and so on. Covering in detail the various tasks that must be performed after implementing the ERP system, the book also discusses different modules of ERP package and the profile of leading ERP vendors. The future trends in ERP, the emergence of new technologies, and the integration of ERP systems with Internet and World Wide Web is also covered. Additionally, the appendix includes Case Studies to help users better understand how ERP systems are implemented in the real world. Simple, easy-to-understand, and jargon-free, the book includes a host of illustrations, bullet lists, and tables. The concepts are introduced first, and the content is organized logically to enable the best possible understanding of the ERP system, its benefits, related technologies, the different modules, the market leaders, ERP system implementation, operation and maintenance. Meant for managers and executives who are responsible for implementing an ERP system in their organization, the book will be a valuable resource in the hands of the top management and decision-makers, ERP project managers or implementation in-charge, middle or functional management executives, employees including Implementation team members and end-users, and students pursuing postgraduate course in ERP.